A coffee-shop restaurant with a very modern twist. 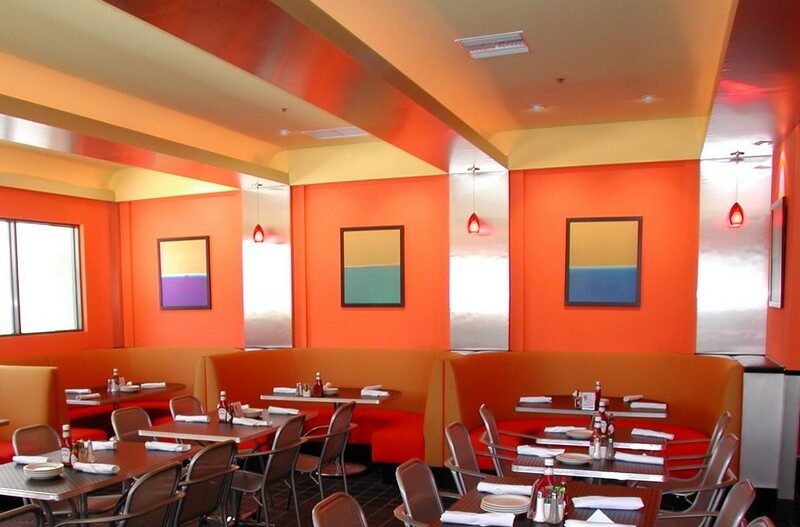 A restaurant has been completed in the town of Santa Paula, California with a theme of high-tech automotive materials. This is no coincidence as the restaurant is built right up against the structure that houses ARP (Automotive Racing Products). I have brought to this project years of experience in the restaurant design field as seen on the website: http://www.eckelberry.biz/ . We picked a bright range of colors for the walls and fabrics that are reminiscent of customized cars and used materials in the decoration that would also be used in race cars such as stainless steel, titanium panels and carbon-fiber look countertops. Some of the wall decorations selected are of race cars that currently use ARP’s line of fasteners. Although the menu is relatively simple, the quality of the ingredients is top-notch as the owner of the restaurant is a very conscious of what is expected in fine dining restaurants and the results are very appetizing. The restaurant caters to local customers that live in the Santa Paula and Ventura area and also those that work in nearby office and industrial buildings. The restaurant’s design contributes to the ongoing transformation of Santa Paula as a tourist destination and emerging fine-dining scene.